Occasional Toronto: 3,000th Post On Occasional Toronto! It is hard to believe but this is my 3,000th post on the blog. To celebrate I thought a new car was in order - as if! 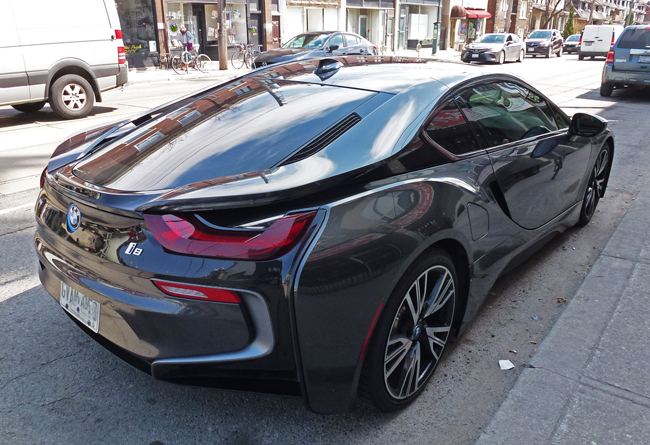 I spotted this BMW i8 and stopped in my tracks to take a close look and get a pic. It not only looks fabulous but it is also a green car, a plug-in hybrid. And those are butterfly doors which makes it even more special! Three thousands! That is an awesome achievement! I started my blog in 2005 five years before you started posting and you are away ahead of me. Congratulations Pat! Congrats, Pat. You've always been one of the most consistent posters on CDP and that is appreciated. I started in 2009 and today is my 2650 post, so I'm not too far behind! When I first glanced at this post I saw that "To celebrate I bought a new car..." :) Darn. This is a beauty, though. But I'd guess the price is a beauty, too. Terrific car with great reflections. I am hoping you will drop this car off at my garage later this week. Congratulations on 8 1/4 years of daily posts. Know you have a wide following. Congratulations Pat! What a milestone! If I could award you that car, I would. Fitting, Pat! You would deserve that car for being a constant source of friendship and good! Are those bicycles on the other side of the street more in your price range? Congrats on your 3,000th post. Nice looking car! Congrats, Pat ! You deserve this car! Bravo on the milestone! Great car! Holy smokes! That is a lot of posts! Congrats!! Congratulations, RedPat! And I love your new car. Congratulations on the 3000th post. That's quite record. Keep on posting. Happy 3000th post! Diggin the 'new car'! That's a lot of posts! Congratulations, and this car quite fitting, and can it be mine?! Moderno.Fantástico y ecológico. Buen coche!! My kids have a hybrid. What a great celebration.